This Friday finds me a little sore and tired, but good. I’ve been painting this week – a little at a time. 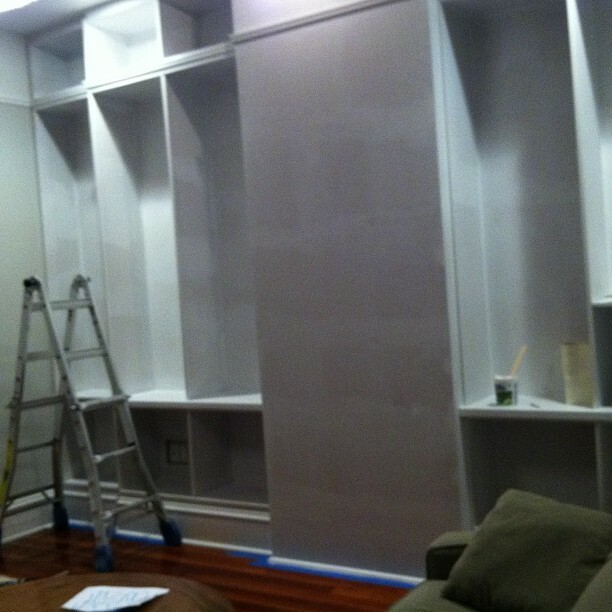 I finished priming the other half of the bookshelves, standing on tiptoes on the ladder to reach inside those upper boxes. It occurred to me in the middle of it that perhaps I should not tempt the broken bone gods at this point, but I was very careful, and had a steady grip the whole time. Last night I started the real paint, and I painted three of the tall boxes. (I’m not going to put any finish coats on those high ones – they are going to have to wait for M to heal.) I’m using a new product, and I’ll give you the run down once I’ve really used it and decided if I like it or not. One thing is for sure – it smells. Probably not as bad as paint used to smell, but once you get used to low- or no-VOC paint, the smellier stuff really gets to you. In other news, today is the last day to vote for the Apartment Therapy’s Homie awards. Thanks to everyone that did – it’s been a lot of fun. I’m just a wee tiny little thing over here, and most of those blogs have already hit the big time – lots of ads and sponsors, and some of them have a whole slew of contributors. There’s certainly nothing wrong with that – and I really enjoy reading a lot of them – but there’s a certain little thrill to hang out with them, even for a bit. For me, blogging will still be a personal outlet, and a small and simple way to connect with others. I’m pulling for my favorite writers at Manhattan Nest and Making It Lovely, as well as Preparing for Peanut in the Family&Kids category – so if you haven’t voted yet, then give them some love, from me. I hope this Friday finds you well. If you’re elbow deep in a painting project as well, do share. It’s a little lonely on that ladder.